Jig! Does it get any more fun than dancing, wigs and accents?! 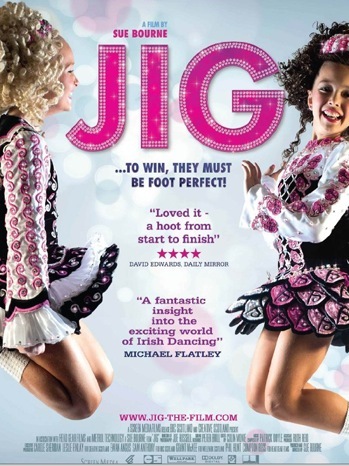 Sign me up for Irish Dancing lessons because after watching the documentary, Jig, I am pretty sure that kicking up one’s heels must be the funnest thing EVER. Jig, a film by Sue Bourne, follows several dancers and dancing teams from all over the world as they prepare for and compete in the 2010 Irish Dancing World Championships in Glasgow, Scotland. Every one of the featured competitors’ stories is fascinating, but I was especially charmed by the young girl from Ireland who lovingly displayed the dress that her grandmother bought her to compete in right before she passed away. I knew she was my favorite when the camera zoomed in on the calendar in her bedroom and you could see where she had written in the birthday of Disney channel star, Emily Osment, write next to her goal to win the world championships. She may be a highly focused performer, but she apparently still finds time to watch Hannah Montana! What I liked most about this film was how HAPPY I felt while watching it. Yes, there are emotional moments such as when a young dancer clutches his stuffed animal and discusses being bullied or when members of the underdog Russian women’s team are refused visas into Scotland. But overall, Jig absolutely sparkles with passion and joy and left me feeling that skipping may just be the best way to travel.